I was interested in the Cleveland-Seattle game from July 30 because of the major-league record Felix Hernandez was potentially about to break, but as it turned out, it was the Indians’ starter that was making the headlines. Corey Kluber, who is now the ace in Cleveland after the Indians traded Justin Masterson earlier in the day, threw an 85-pitch shutout to defeat Hernandez and the Mariners, 2-0. 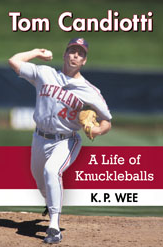 In his previous outing, the 28-year-old right-hander had taken a perfect game into the seventh inning against Kansas City back on July 24 in the Indians’ eventual 2-1 loss to the Royals. According to Jeff Passan of Yahoo! Sports, Kluber’s gem against Seattle marked just the seventh major-league shutout on 85 or fewer pitches in the 21st century . 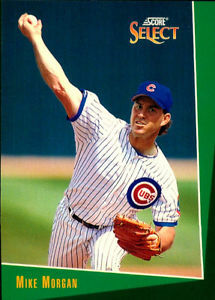 That stat – so few pitches in a shutout – reminds me of a game in particular, one that featured Greg Maddux against his former Cubs teammate, Mike Morgan. It was an ESPN Sunday Night Baseball game back in the 1995 season, where the Atlanta Braves beat the St. Louis Cardinals 1-0 in a contest that took under two hours to complete. That night, Maddux tossed a two-hit shutout to outpitch Morgan, who allowed only six hits and a walk over eight innings . A quick search on Baseball-Reference.com reveals that that game took place on August 20, 1995, with Maddux throwing only 88 pitches – 66 for strikes – in his nine innings. As for Morgan? He threw 84 pitches – 55 for strikes – over his eight innings of work. It might have been his best start of the season – and he did come within two outs of throwing a no-hitter against the Montreal Expos over a month earlier on July 3. A tidy, efficient game for both pitchers, with the only run of the game coming in the third inning when Marquis Grissom led off with a double, moved to third on Jeff Blauser’s sacrifice but, and came home on Chipper Jones’ grounder to second base. That was all the scoring for the night, with the game lasting only an hour and 50 minutes. Any baseball fan knows about Maddux’s dominance that season – where the Braves ace right-hander went 19-2 and captured his fourth consecutive Cy Young Award – so I won’t talk much more about him. Let’s talk a little bit about Morgan, who went just 7-7 despite a respectable 3.56 ERA in 21 starts. Apparently, if you made him throw enough pitches – something that the Braves didn’t do – you were going to get to him in the late innings. More specifically, Morgan was virtually unhittable in his first 75 pitches in 1995, but became a batting practice pitcher on his 76th pitch onward. That’s what Dodger third-base coach Joey Amalfitano told first baseman Eric Karros before he stepped up to the plate to face Morgan in the sixth inning on August 9, 1995. Next thing you knew, Karros stroked a two-run homer on the Cardinals right-hander’s 76th pitch of the night, and the Dodgers – with knuckleballer Tom Candiotti on the mound – went on to beat St. Louis, 4-2. Speaking of Candiotti, he himself also once tossed a complete-game 1-0 shutout where he threw only 85 pitches. The knuckleballer fanned three and didn’t walk a hitter in the four-hit shutout. But that was a spring-training game back in 1987 between the Cleveland Indians and the Oakland Athletics, though the A’s did have their everyday players in the lineup that afternoon. According to an old San Jose Mercury News story from March 28, 1987, Tony Phillips (0-for-3), Carney Lansford (0-for-3), Jose Canseco (2-for-3), Reggie Jackson (0-for-3), and Mark McGwire (0-for-3) all played in that game. Ahhhhh…great memories, and it’s thanks to Corey Kluber, the new ace of the Indians. According to that same Yahoo! Sports story, Kluber faced one batter over the minimum in nine complete innings for his second straight start, which marked the first time it had happened in big-league history. Poor Morgan. He was also the losing pitcher in Dennis Martinez’s perfect game against the Los Angeles Dodgers in July 1991, dropping a hard-luck 2-0 decision. He gave up only four hits in a complete-game effort, with both runs off of him unearned. The July 31st trading deadline in Major League Baseball in 2014 featured a couple of blockbuster deals which first saw the Oakland Athletics acquire left-hander Jon Lester and outfielder Jonny Gomes from the Boston Red Sox for slugger Yoenis Cespedes, and then the Detroit Tigers stunning the baseball world hours later with the addition of former Cy Young winner David Price from the Tampa Bay Rays in a three-team trade which also involved the Seattle Mariners. Outfielder Austin Jackson, who was part of the Price deal and had been traded to the Mariners, was actually patrolling center field for the Tigers when he was pulled in the seventh inning of Detroit’s afternoon contest against the Chicago White Sox. That reminded me right away of the Jose Canseco trade back in 1992, when the A’s slugger was standing in the on-deck circle in the bottom of the first inning with teammate Jerry Browne at the plate facing Baltimore Orioles right-hander Mike Mussina on the night of August 31 in Oakland. 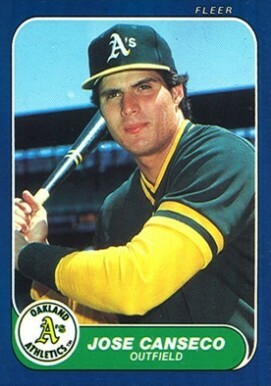 Canseco, who was hitting third in the lineup and playing right field for the A’s that night, was called back to the dugout by skipper Tony La Russa while Browne was still batting. Lance Blankenship, a utilityman who played all three outfield positions as well as first base and second base for Oakland in 1992, was sent out to replace Canseco . What happened was A’s general manager Sandy Alderson had just pulled off a trade with Texas, sending Canseco to the Rangers in exchange for outfielder Ruben Sierra and pitchers Bobby Witt and Jeff Russell. So, the 1988 American League MVP was out of the game, after having played the top of the first inning in right field. Okay, so not quite the way things unfolded in Detroit in 2014, with Austin Jackson being pulled while he was still on the field, but still… kind of a similar situation, being traded in the middle of the contest. At least that was the first thing that came to mind when the details of Jackson’s departure from the Tigers-White Sox game was announced. And getting back to Canseco, the trade of Cespedes to the Red Sox reminds me of that 1992 deal as well. Cespedes, who is of Cuban decent just like Canseco, has just gone from a team that is considered a potential World Series contender to a club that’s not going to make the playoffs. Just like how Canseco went from the first-place A’s in ’92 to the Rangers, who would finish a disappointing fourth with a 77-85 record despite Juan Gonzalez’s 43 home runs and 37 victories posted by the duo of Kevin Brown (21-11) and Jose Guzman (16-11). Going from a contending team to an also-ran… obviously is very disappointing. That exact same thing, incidentally, also happened later to Sierra, one of the players picked up in the Canseco trade, as the moody outfielder would be dealt from the first-place New York Yankees in 1996 to lowly Detroit in exchange for another slugger, Cecil Fielder. The Yankees went on to win the World Series that year, denying Sierra of a shot at a ring. One last thing about Canseco. Remember back on July 29 when Cubs catcher John Baker took the mound in the 16th inning of their marathon against the Colorado Rockies? Baker got the pitching victory and even scored the game-ending run in the bottom half of the 16th, but Canseco was not so fortunate in 1993. With Texas getting blown out in Boston, Canseco persuaded Rangers skipper Kevin Kennedy to let him pitch the eighth inning, and he wound up blowing out his arm which eventually required Tommy John surgery. 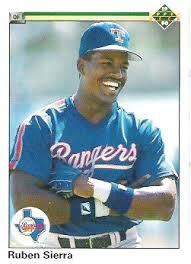 Ironically, DH Chili Davis of the Angels also pitched during that 1993 season, in a blowout loss to Texas. Davis had better luck too, working two hitless innings but hitting Canseco with a pitch. Ahhh….baseball back in the good old days…. Obviously, these trades in 2014 are very exciting to A’s and Tigers fans, but certainly it brought back some memories from seasons past. And, oh, of course, trades can still happen after the July 31st deadline – but players would have to clear waivers – so we’ll see if any other interesting moves take place down the stretch. 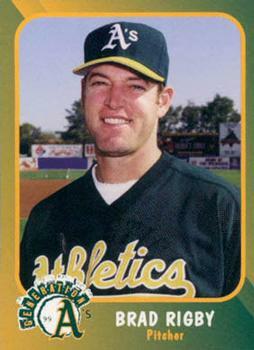 Blankenship also played third base for the A’s in each of the previous two seasons, and would appear in two games at shortstop for Oakland in his final big-league season in 1993. You are currently browsing the archives for the Athletics Baseball category.